B&G autopilot steering the author’s Cal 40 in “delivery mode.” This below deck system makes doing a solo offshore delivery relaxing and easy. Need an extra pair of hands to help steer your boat? Autopilots are self-steering devices for power or sailboats. They can hold your vessel on a pre-set compass course (even the most basic pilots do this) and sophisticated pilots that connect to GPS receivers or gather data from your boat’s instruments can handle a lot more advanced tasks. Autopilots do a great job of holding a steady course in light to moderate conditions with minimal helm movements. They don’t get tired like their human counterparts and have an infinite attention span. They will open up opportunities to use your boat that you would otherwise miss due to lack of crew and because they steer so accurately, they will save fuel and get you to your destination faster, especially when interfaced with a GPS. Autopilots all include three main components: a heading sensor that is usually a fluxgate compass, a central processing unit (a Course Computer) that is the “brain” of the autopilot, and a drive unit, a motor or hydraulic pump that applies force to your boat’s rudder. More complicated pilots connect to additional sensors: data sources that may include a masthead wind vane; a rudder reference that tells the pilot’s processor where your rudder is pointed; a rate gyro that keeps track of momentary yaw and pitch movements and a GPS receiver or a speedometer. The drive mechanisms, matched with your boat’s type of steering, are how autopilots vary the most from one another. We’ll discuss how to choose the right one later. Autopilot operation is simple, put the vessel on the desired heading, hold the course for a few seconds, press AUTO, and release the helm. The autopilot will lock the course in memory, and will respond with helm corrections to keep your boat on this course. Modern autopilots have various methods of maintaining a more accurate course than their predecessors, such as auto-trim, auto sea-state, and integration with GPS. The latest developments include SmartSteer software algorithms from Raymarine, which use a rate gyro to more accurately detect off-course deviations, and an algorithm that learns your boat’s handling characteristics to improve steering over time. 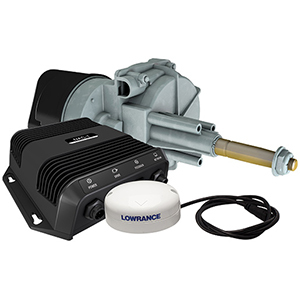 Lowrance Outboard Pilot for a boat with rotary mechanical steering. This cockpit pilot pack includes the course computer, GPS receiver and drive unit, which replaces the boat’s rotary helm. Here’s a basic rule: If you have a hard time holding a course, your autopilot will too. Unlike a windvane (a stern-mounted mechanical self-steerer used on cruising sailboats), autopilots work harder as seas build and wind gets stronger. Eventually, the limits of the pilot’s power output are reached, and the device gets overwhelmed. According to cruising expert and naval architect Steve Dashew, a correctly-sized autopilot uses 10 percent of its power (or less) about 75 percent of the time, and all its power less than one percent of the time. If you use your boat on a calm lake, this won’t matter. If you are a bluewater cruiser, that one percent of the time might be when you really want your pilot to work for you, in nasty weather when the conditions in the cockpit will be the worst for both you and your steerer. Over the years we’ve learned quite a bit about what works and why things fail. By sharing this information with you, we hope you can avoid the inconvenience of autopilot failure. Probably the biggest problem with autopilot reliability is that long-distance sailors frequently buy small, cockpit-mounted autopilots, and then expect them to operate flawlessly over a multi-year cruise. When their autopilots need repair, and they will need repair eventually, our customers find themselves in a location where it is difficult or impossible to get the unit serviced. Many cruisers sail short-handed and rely on the autopilot for much of the steering, so they are in a pickle when it fails. Common reasons for failure include saltwater intrusion in the central processing unit, water in the drive motor and corrosion in the power supply socket. You have a backup autopilot in case the first one fails. You have a windvane steering system and don’t depend solely on the autopilot. You love steering by hand for long hours. Raymarine Autohelm Series ST2000 Tillerpilot is a common cockpit pilot. You may need to order pushrod extensions, cantilever brackets, or other hardware. What Are the Displacement and Length of Your Boat? How can you estimate the limits and correctly size your autopilot? Boat design, length and displacement are critical. In general, long, narrow boats, boats with v-shaped forward sections and long-keeled sailboats are more directionally stable. How easy is your boat to steer? Keel-hung rudders of the “barn door” configuration require more power to move them than light-steering balanced spade rudders. If your boat is not well balanced, your pilot may have to fight weather helm (and you might want to throw a reef in your mainsail or change to a smaller jib to balance your helm, for example). Remember that a tiller-mounted pilot is trying to steer about 18" away from the axis of the rudder. An autopilot is not a solution for a hard-to-steer boat. Below-deck autopilots are far more powerful, more reliable, and better at steering, so they should be your first choice for long distance cruising. To purchase a correctly sized autopilot, start with manufacturer’s recommendations. They don’t always work, but begin by finding out which autopilot is recommended for your type of boat. If you are near the upper limit of the manufacturer’s recommendations, especially in displacement, go up one size. Remember that your boat’s displacement may increase by 20% when loaded for cruising. The easiest job for an autopilot is to steer a boat under power in calm seas. The smallest autopilot we offer could steer a 75' ocean racer under these conditions. But that example is misleading, since you’ll want an autopilot that works well under more demanding conditions. Downwind, autopilots have to throw the helm over to counteract overtaking seas. A sailboat with a spinnaker up must have fast response to avoid round-ups, or worse yet, round-downs! Powerboats need responsive pilots downwind as well since they tend to slew and yaw as they run down seas. Slow pilots get out of synch with the waves, and oversteer as a result. The best way to measure the speed of an autopilot is the number of degrees per second of helm correction, not hardover time, which may include more or less throw for different models. We suspect that a 25' boat may require 15° per second; a 40' boat may require 10° per second; and a 70' boat may require 5° per second. Steve Dashew recommends a turn rate of 8° to 15° per second, under the heaviest of loads. Shaman, my vintage Cal 40 sailboat, yaws strongly in following seas. The autopilot often seems to magnify this yawing, since it can’t anticipate the waves like a person can. I found that by using a fast enough pilot with AutoLearn (an adaptive program that enables rate gyro equipped pilots to “AutoLearn” the vessel’s steering characteristics) and by adjusting the “damping” on the pilot, I can get the boat to work with the autopilot in waves, but I have often resorted to hand steering. Modern autopilots, like Raymarine’s Evolution Series and Garmin’s Reactor Series, make this adjustment and calibration a lot simpler. Do You Want an Above-deck or Below-deck Pilot? Sailboats: To choose a cockpit-mounted sail autopilot, select a tiller pilot (like Navico’s TP-10, TP-22 or TP-32 or Raymarine’s EV-100 Tiller) or wheel pilot that matches your boat’s displacement, following a conservative approach of moving up a size when in doubt, and adding 20% to the boat’s displacement for typical cruising gear. Sailboats with tillers:The Raymarine EV-100 Tiller system fits boats up to 13,200lb. displacement. 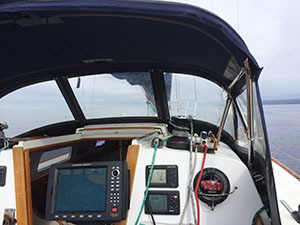 Sailboats to 40' with mechanical wheel steering: Use cockpit wheel pilots like the EV-100 Wheel Pilot Pack. They are easy to install and have adequate performance for most conditions. Again, for trans-ocean use, we’d upgrade to a below-deck pilot, like one of Raymarine’s EV-200 or EV-400 Sail Packs, Simrad’s AP24 Autopilot for Cable Steering Boats or Garmin’s GHP 12. Below deck pilots like the 0.5 Liter cylinder for Raymarine EV-100 Power Autopilot are built for hydraulically-steered powerboats. Wheel-steered sailboats over 38' will use a more powerful below-deck linear drive pilot, which is protected from the elements and much more durable. Installation on any below-decks pilot is more expensive. Garmin, Raymarine, Simrad and B&G all make this style of autopilot. Powerboats: Raymarine, Garmin and Navico (which includes Simrad, Lowrance and B & G) make complete below deck systems for your hydraulically steered outboard or inboard boat. Garmin’s GHP 10 and GHP 20 autopilots include a unique “Shadow Drive” that automatically disengages the autopilot if the helm is turned, allowing you to maneuver the boat. The autopilot automatically re-engages when you hold a steady course. Choosing a below-deck pilot for either a powerboat or a sailboat is a three step process, involving 1) selecting a drive unit, 2) selecting a corepack and 3) selecting a control head. What Type of Steering System Does Your Boat Use? Selecting a drive unit is based on the type of steering in your boat. Linear drives: Most common type for mechanically-steered sailboats, move the rudder directly from the tiller arm or rudder quadrant. Mechanical drives operate using an electric motor with a clutch (disengages drive to limit the backdrive force when on standby). 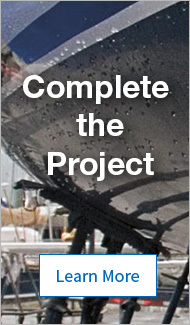 Hydraulic linear drives use a self-contained system with a bypass valve to move the rudder. Rotary drives: For chain and cable steering systems (cable and rod systems like Edson and Whitlock pedestals). May require selection of a sprocket from among sizes including gears with 13, 15, 17, 19 and 25 teeth. 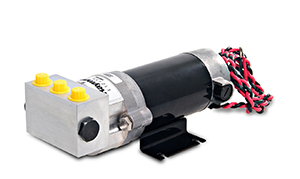 Hydraulic drives: Used for boats with hydraulic steering systems. Select the right hydraulic drive unit based on the capacity (in cubic inches) of your hydraulic steering ram. An autopilot controller like the Garmin GHC 20 Helm Control is necessary when installing a below deck pilot. If Your Steering Is Hydraulic, What Is the Ram Size? Select the right hydraulic drive unit based on the capacity (in cubic inches) of your hydraulic steering ram since the drive unit is a supplemental pump that actually moves your ram. 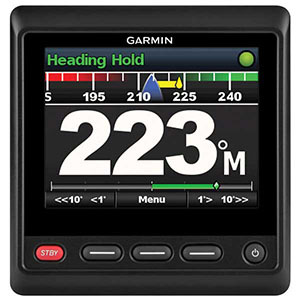 Note that Garmin’s GHP 20 system uses a one-size-fits-all drive unit, removing the need for this choice. Corepacks include three necessary components: the Course Computer, the fluxgate compass, and a rate gyro, so functions like “AutoLearn” will work. Raymarine’s Evolution and Simrad’s AP24 and AP28 core packs are available with different levels of completeness; some include drive units and displays. Select the corepack that matches the amperage draw of the drive unit and the displacement of your boat. 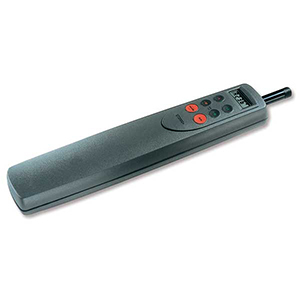 What Control Interfaces (Displays, Remotes, Etc.) Do You Want? Control heads combine autopilot controls and an LCD display in a waterproof cockpit-friendly enclosure. They plug into the course computer with an NMEA 2000, SeaTalk or SimNet cable. If you own one of the more common types and sizes of vessel, you can save money by getting the whole package made for your type of boat. Be sure that all the members of your crew know how to disengage the autopilot (by pressing the red STANDBY key on Raymarine units, for example). Be aware that any autopilot can fail, possibly at the most inconvenient time such as when you are inside a narrow channel. Autopilots can be subject to interference from a transmitting SSB radio, for example, which could make your boat execute an alteration in course. Never put yourself in a situation that could become dangerous should your autopilot stop functioning. Always keep a proper watch so you can respond to unexpected situations.